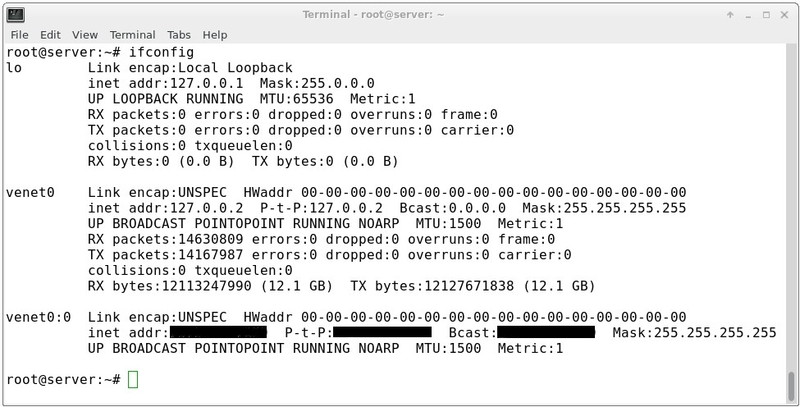 It's not so uncommon to lost network access to the server via SSH (e.g. due to accidentally misconfigured VPS or etc.). Knowing this we offer alternative method to connect to the server in extra cases like this - Web Console. This tutorial will help you to pin point causes of the issue and restore accessibility via SSH. 1. Press "Mange" in the end of the line of server you want to connect. 2. Then press ">_Console" button. 3. Choose for how long do you want to access console and press "Continue". 4. After few minutes you will get link to the Web Console. Enter your login details and login. More information (with pictures) about our Client Area can be found here. Note: In black squares you should see IP of your server. Note: In the place of IP_of_your_server you should write IP of your server. If it's pinging, hooray, your server once again have network access. Try to connect to the server via SSH. If you did not got any answer it means that SSH is not started. To whatever not taken port in range 1 to 65535. To test if it worked simply try to connect via SSH again. If you still have problems accessing your VPS via SSH, open support ticket and we will help you to resolve the problem.